Soon after buying my Honda CBF500, it became rather apparent that I was going to use this bike for touring. In my quest to make it the perfect bike for an adventure, I was in need of some suitable luggage. After much research, we decided to purchase the SW-Motech Blaze Panniers. If there is one thing you take from this review, let it be that they are UTTERLY BRILLIANT! Typically, soft saddlebags do not hold their shape when empty, are tricky to mount and are generally challenging to use. Placed incorrectly on the bike or unevenly loaded, they have a tendency to shift, leading to potentially damaging contact with the exhaust pipe. However, the Blaze Panniers are unique and their various mechanisms ensure such things do not happen. So, what makes them so brilliant? The bags are ridiculously easy to mount and fix into place – here are the steps and my thoughts. Attach – You have to attach model-specific brackets to the bike’s passenger foot-pegs but this is simple and the instructions are clear. I keep these on regardless of whether or not I am using the luggage as they are small, discrete and cause me no hassle with my day to day riding. Aluminium rods – An aluminium rod securely clicks into one side of these brackets, each clearly labelled ‘left’ or ‘right’, pointing towards the rear of the bike. This mechanism is faultless and believe me there is no way the rods can slip out. I cannot remove the rods and Iñigo often finds himself having to apply pressure, using a screwdriver, to remove them after a trip! Slip the bags on – The back of the corresponding bag has a pocket where these rods slip into. With the rod supporting the bags along their full length, they are completely steady and secure. Velcro – Further support occurs when connecting the two bags together, over the passenger’s seat, with the use of a very wide Velcro strap. I advise you double check this and re-adjust the Velcro before taking off. I sometimes find that after fiddling around, adding and removing stuff from the bags, placing my helmet on top and doing general things before taking off, the Velcro loosens ever so slightly. Clip the bags to the bracket – Quickly clip the bags into the original bracket. Before a long trip, I will often check that the brackets are tight enough and rigid- you only have to tighten the strap and it takes no more than a minute, having said that, they have never come loose. Overall, the initial hardware installation and the general everyday mounting of the bags is simple and terribly easy to do. I take no more than 2 minutes to prepare the bike and have everything clipped into place. The mechanisms are robust, sturdy and effective, I trust them 100%. Although I do not take pillions, it is great that the bags and the brackets, do not prohibit carrying a passenger, like other setups do. Not only do these bags hold their shape terribly well, they are stable whilst riding and the straps never seem to loosen. If mounted correctly, they are secure and have never caused me any problems. Sadly, I have dropped my bike from standstill with all the luggage on and I was incredibly surprised and pleased that the bags had not shifted and the straps had not loosened in any way! This was incredibly encouraging. The Velcro strap helps to fully secure the bags in place and further distributes the weight. Additionally, the back of the bags are lined with a non-slip material, unlike the outside, which again, prevents them from moving. The exterior bags are sheathed in heavy-duty nylon, which have remained unscathed when I dropped my bike, I am tempted to say they are bulletproof! These durable bags keep their shape when empty, are very light and easy to pack. In order for the whole system to be fully waterproof, each bag comes with a waterproof dry roller bag, which is where you place your belongings. Tested in ALL weather, I am pleased to say that not even the torrential rain in Devon, nor the snow in Germany has permeated through to my clothes or belongings. In total, each bag holds 14 litres, but this is expandable to 21 litres. I have been on trips for over 10 days and have never had to expand the bags! I find there is plenty of space when the bags are collapsed and I am forever amazed at how much more I could place in each bag should I need. Each bag also has a small external organiser pocket. In my opinion, although this might sound silly, the best part about these bags is how easy they are to carry once you take them off the bike. When you remove the bags off the rods individually, you re-Velcro them together using the wide strap. A handle at the top of each bag, then joins them together and you can carry them in one hand, whilst you carry your helmet in the other and walk into the hotel stress-free! This simple joining of the luggage is brilliant. 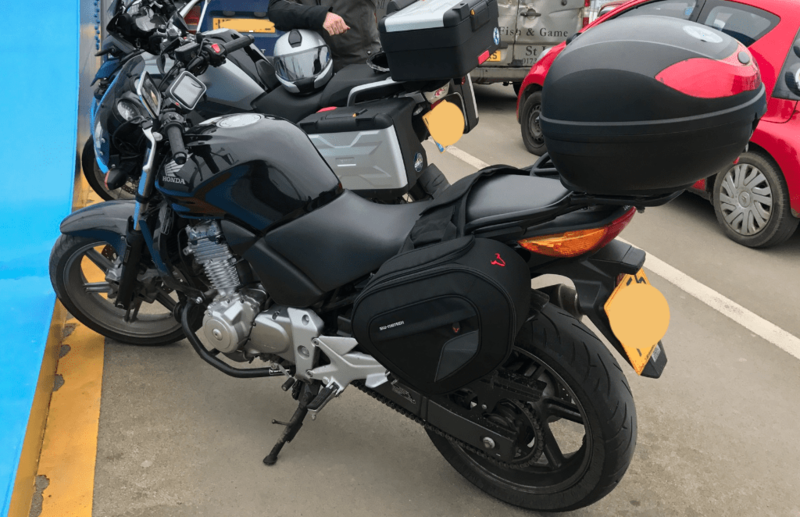 I have had the SW-Motech Blaze Panniers for nearly two years now and they have travelled with me across the UK, France, Belgium and Germany, exposed to all elements. I must say that I am most impressed by their simplicity, easy use, durability and stability. They seem to address all the shortcomings regular soft luggage. Not only are they ideal for touring, but collapsed, I think they would be great for daily commuting too. However, it must be mentioned that the bags do not come with padlocks. I use an individual small padlock on each bag and then for full security a 1 metre Luggage Cable Lock. Due to the way they are mounted and work, the panniers are perfect for naked and sports bikes. This is evidenced by how brands such as Yamaha and BMW have created their own panniers, based on these for the MT-09, R6, S1000R and S1000RR. Discrete yet efficient, these panniers are utterly brilliant. I have an SW-Motech tank bag on my GS that is 8 years old. It is a little faded in color, but otherwise still perfectly functional. Very good quality! I ride with ADV Horizons and agree the simplicity of soft bags are great. Good quality, and wonderful mounting system, although I don’t like relying solely on Velcro straps to secure the bags across the bike, some clip would give piece of mind. Panniers need to be bigger, or offer several designs for the same mount? We thought the same about the velcro but the experience has been really positive, the velcro is really strong and it doesn’t even move. The good thing about these are that they are expandable which gives you some flexibility but different models with the same mounts would be nice indeed! Hi, indeed I ‘ve never heard of a problem with the Velcro, it’s just piece of mind? Good though these panniers are, I do feel that they are a little pricey? They are indeed expandable….from small to not quite so small!